What Causes A Bathtub Drain To Leak? Bathtub drains do just what they are named after - they drain the water from the bathtub TO the horizontal drain pipe beneath the floor. When it comes to leaks from the bathtub drain, oftentimes the leak is one that has been ongoing for quite some time without being detected. This, of course can easily end up creating water damage that can lead to mold, mildew and certainly damage to floors, walls, etc. Bathtub leaks are notorious because they CAN go undetected for so long. For this reason, it's important to get them fixed as soon as you notice them. But, what causes a leak from the bathtub drain? The answer can be one of three issues. A problem with the construction or quality of the plumbing below the bathtub drain. It could be it wasn't installed correctly. It could also be that inferior products were used. A faulty seal around the bathtub drain assembly. These issues can be resolved with some plumbing know how (if you are so inclined). Or, you can call in a professional plumber to do the job. So, if you are a DIYer following are some steps on how to repair a leaky bathtub drain. You will want to remove the drain from the bathtub. To do this use a drain removal tool (this is the easiest) or you can improvise with a wrench or pliers and a screwdriver. Once you place the tool in the drain holes, turn it clockwise (you may have to put in some muscle here) and remove the drain. Scrape off the old plumber's putty - clean it with hot water so that you can inspect it for any damage. If there is damage then you will have to replace the drain. But, if it looks as if the drain itself is in good condition, then let it dry. Get some plumber's putty and roll it between your palms to create a thick string. Wrap this putty string around the base of the drain. Put the drain back where it belongs and make sure to tighten it as much as possible (you will see the putty oozing out from the edges). Clean up the excess putty. Here's a video showing you these steps I mentioned above. If you still have a leak after going through this process then the issue is most likely the plumbing under the bathtub. We recommend you call in a professional plumber to correct that problem. 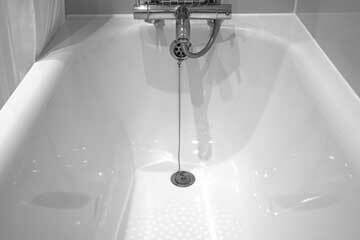 If you have any questions about bathtub leaks, call Atlantis Plumbing today at 770-505-8570. We are available 24 hours a day, 7 days a week.